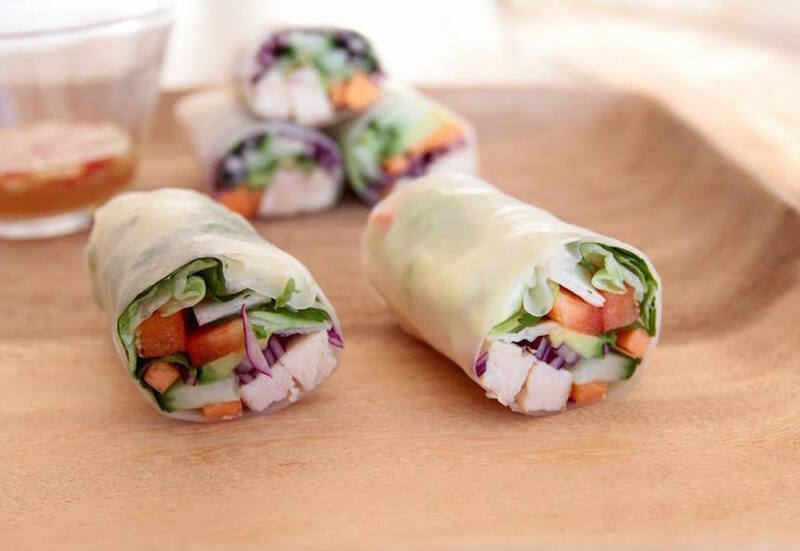 These Vietnamese rolls are such a treat for the whole family. I have made them with chicken but you can easily replace it with prawns, rice noodles or more veggies. For the chili sauce simply add all the ingredients into a small bowl. With a fork whisk it all together and set aside. When all your vegetables and chicken is cut and ready add some hot water to a bowl and place one piece of rice paper in the water. Let it soak for about 15 seconds until it gets soft. Then place it on a tea towel for the water to drain and after place it on a board. Then add a little bit of the different veggies, chicken and coriander. Don’t put to much otherwise it will be difficult to roll. When you are ready to roll start by lifting the edge of the rice paper nearest you. When you are halfway fold the ends of the paper over the filling to close and continue to roll. Make sure you roll them tightly and repeat with the next roll. When this is done cut the rolls in half and serve them with some chili sauce.